had a vision to bring together their collective talents, passions and business experience to create an irresistibly gorgeous product and fantastic service to match. We at Cup Cake Creations have a product that tantalises all the senses: sight, touch, taste, smell and sound. The business started by selling gourmet cupcakes at stalls, fetes, fairs and local markets. With our delicious homemade recipes and butter icing, our cupcakes have delighted 1000's of people, young and old. 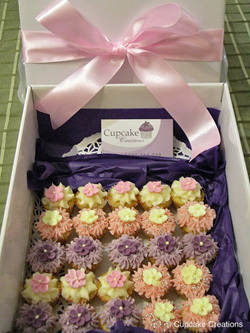 There are numerous copies on the market today, but only one original, Cup Cake Creations. "All you have to do is taste the difference"
We offer our services to birthday parties, weddings, engagements, corporate functions, or any other special occasions you may have. As well as this our delicious tasting cupcakes are available to order all year round. Our flavours include Double Choc D'Lite, Vanilla and Strawberry and each cup cake is meticulously decorated with ornaments such as flowers, butterflies or hearts. In addition to our regular sized cupcakes we offer a selection of mini treats cupcakes. Please visit the products page and the gallery page for more information about what is available to order. Every now and then, everyone can allow themselves a little taste of sweetness. The tempting aromas of our cupcakes always bring smiles to all faces. Our fluffy, flavoursome treats allow the ones who sample them a special moment of pure indulgence, and from then on, the temptation is hard to resist!